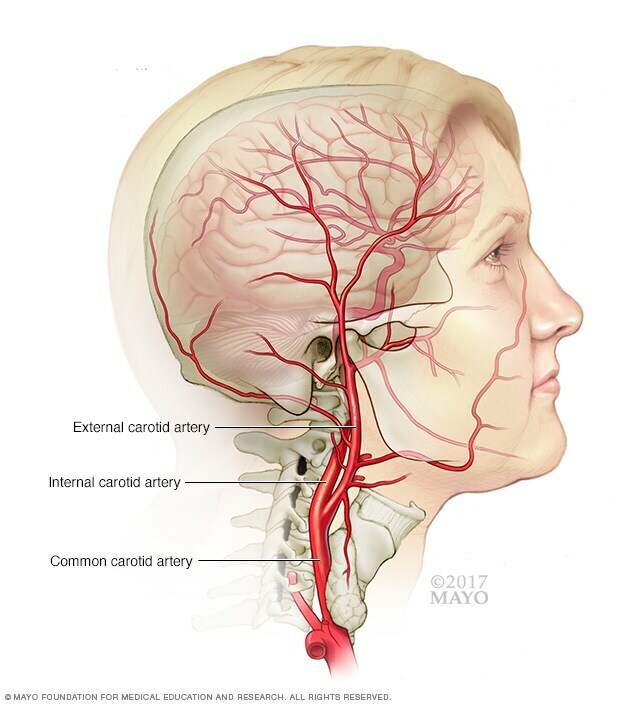 In its early stages, carotid artery disease often doesn't produce any signs or symptoms. The condition may go unnoticed until it's serious enough to deprive your brain of blood, causing a stroke or TIA. Seek emergency care if you experience any signs or symptoms of stroke. Even if they last only a short while and then you feel normal, see a doctor right away. You may have experienced a TIA, an important sign that you're at risk of a full-blown stroke. Talk to your doctor if you have risk factors for carotid artery disease. Even if you don't have any signs or symptoms, your doctor may recommend aggressive management of your risk factors to protect you from stroke. Seeing a doctor early increases your chances that carotid artery disease will be found and treated before a disabling stroke occurs. High blood pressure. Excess pressure on artery walls can weaken them and make them more vulnerable to damage. Tobacco use. Nicotine can irritate the inner lining of your arteries. Smoking also increases your heart rate and blood pressure. Diabetes. Diabetes lowers your ability to process fats efficiently, placing you at greater risk of high blood pressure and atherosclerosis. High blood-fat levels. High levels of low-density lipoprotein cholesterol and high levels of triglycerides, a blood fat, encourage the accumulation of plaques. Family history. Your risk of carotid artery disease is higher if a relative has atherosclerosis or coronary artery disease. Age. Arteries become less flexible and more prone to injury with age. Obesity. Excess weight increases your chances of high blood pressure, atherosclerosis and diabetes. Sleep apnea. Spells of stopping breathing at night may increase your risk of stroke. Lack of exercise. It contributes to conditions that damage your arteries, including high blood pressure, diabetes and obesity. Ruptured plaques. A piece of a plaque may break off and flow to smaller arteries in your brain. The plaque fragment may get stuck in one of these smaller arteries, creating a blockage that cuts off blood supply to part of your brain. Blood clot blockage. Some plaques are prone to cracking and forming irregular surfaces on the artery wall. Your body reacts as if to an injury and sends blood cells that help the clotting process to the area. 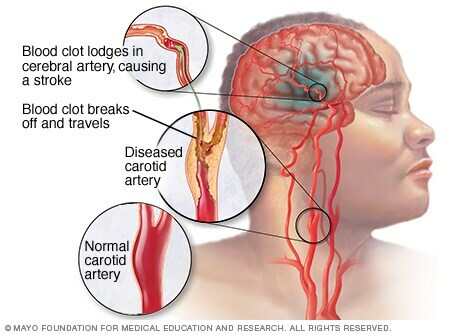 The result can be a large clot that blocks or slows blood flow to the brain, causing a stroke. Don't smoke. Within a few years of quitting, a former smoker's risk of stroke is similar to a nonsmoker's. Maintain a healthy weight. Being overweight contributes to other risk factors, such as high blood pressure, cardiovascular disease, diabetes and sleep apnea. Limit cholesterol and fat. Cutting back on saturated fat, in particular, may reduce the buildup of plaques in your arteries. Eat a variety of fruits and vegetables. They contain nutrients such as potassium, folate and antioxidants, which may protect against a TIA or stroke. Limit salt. Excess salt (sodium) may increase blood pressure in people who are sensitive to sodium. Experts recommend that healthy adults eat less than 1,500 milligrams of sodium a day. Exercise regularly. Exercise can lower your blood pressure, increase your level of high-density lipoprotein (HDL) cholesterol — the "good" cholesterol — and improve the overall health of your blood vessels and heart. It also helps you lose weight, control diabetes and reduce stress. Control chronic conditions. Managing conditions such as diabetes and high blood pressure helps protect your arteries.